As the Trump Administration continues to ramp up its dominant xenophobic narratives, we see the increasing fear in our immigrant communities. We understand that this administration is set on the detention and deportation of immigrants through the augmentation of hired Immigration and Customs Enforcement (ICE) and Customs Border Patrol (CBP) agents. The effects of this increase on enforcement is being documented nationwide. From Florida, Washington, New York and even in California, the number of Border Patrol sightings on public interstate transit continues to increase each passing day. 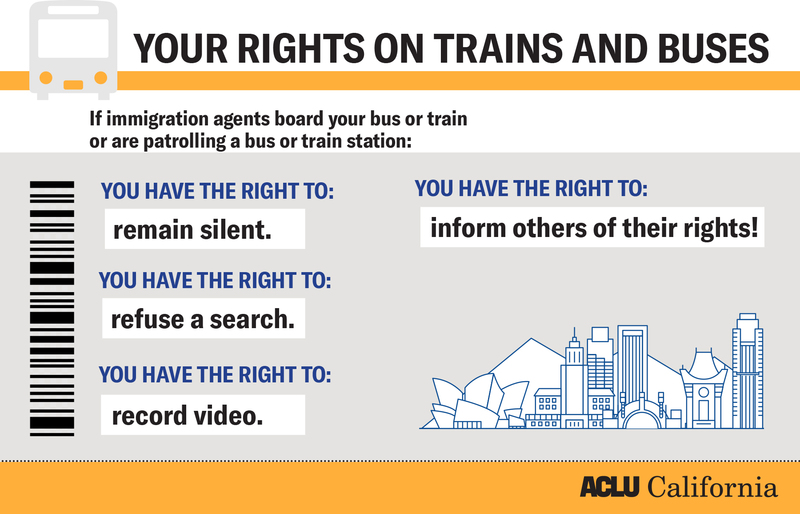 We at the American Civil Liberties Union (ACLU) believe that every individual’s constitutional rights (whether they are citizens or not) apply when traveling in interstate public transit such as Greyhound or Amtrak. 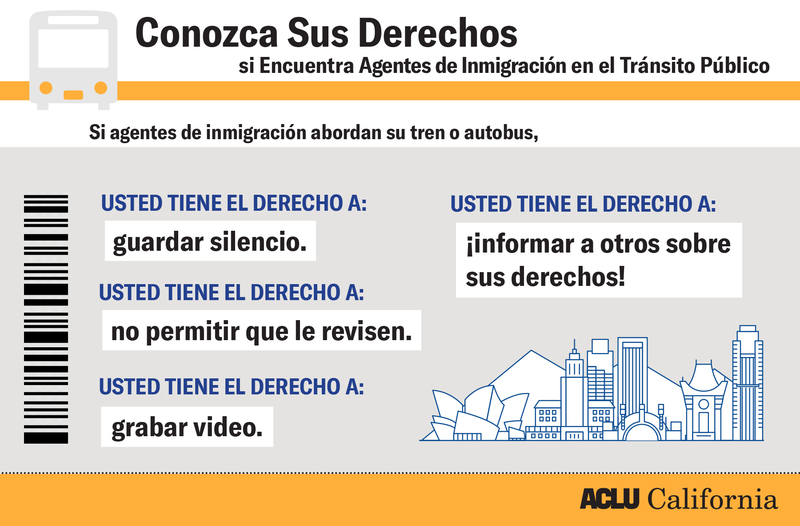 For this reason we are creating a toolkit for advocates like yourself to help community members express their rights and for employees of public transit to know that they are not mandated to let ICE or CBP agents onboard without the necessary legal requirements such as a warrant. If immigration agents board your bus, you can remain silent. You are not required to answer any questions about your citizenship or immigration status and can refuse to do so. A person without lawful status in the United States should never answer questions about their immigration status without first consulting with a lawyer. Any voluntary statement made to CBP can and will be used against that person to deport them. You always have the right to remain silent. You can refuse a search of your belongings by saying "I do not consent to a search of my belongings." You can ask Border Patrol why they're stopping you. You have the right to video record the immigration agents. Download the ACLU's Mobile Justice CA app for free on the Google Store and Apple Store. This application lets you record any and all encounters with law enforcement and as a result sends a copy to the ACLU for review and safekeeping. Tell your fellow passengers they have rights and should use them! 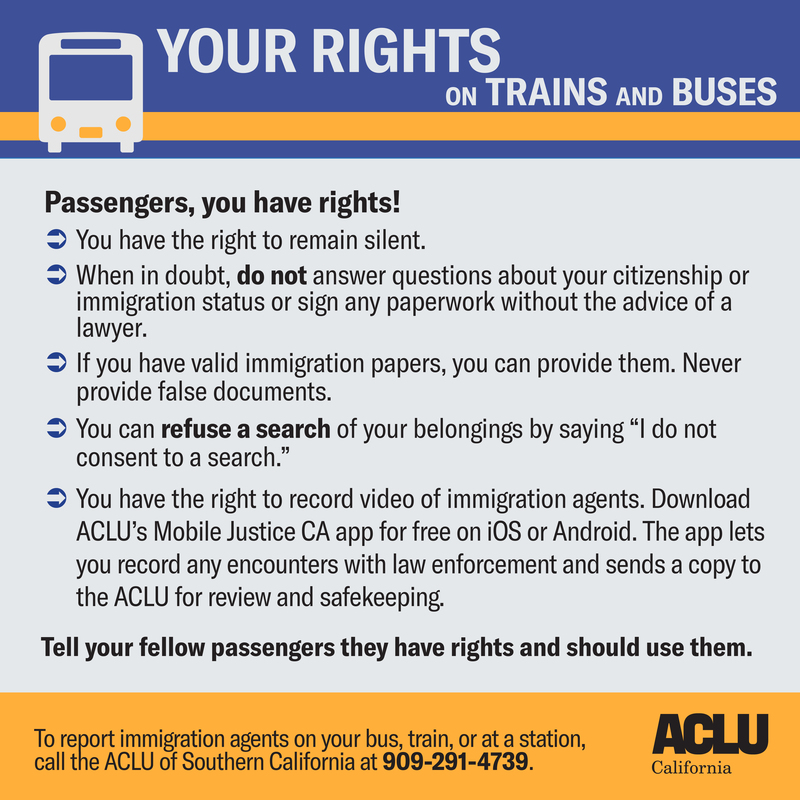 To report immigration agents on your bus, train, or station call the ACLU of Southern California at 909-291-4739. Download this information in a printable image. BAJE ESTA INFORMACIÓN EN UN GRÁFICO IMPRIMIBLE. 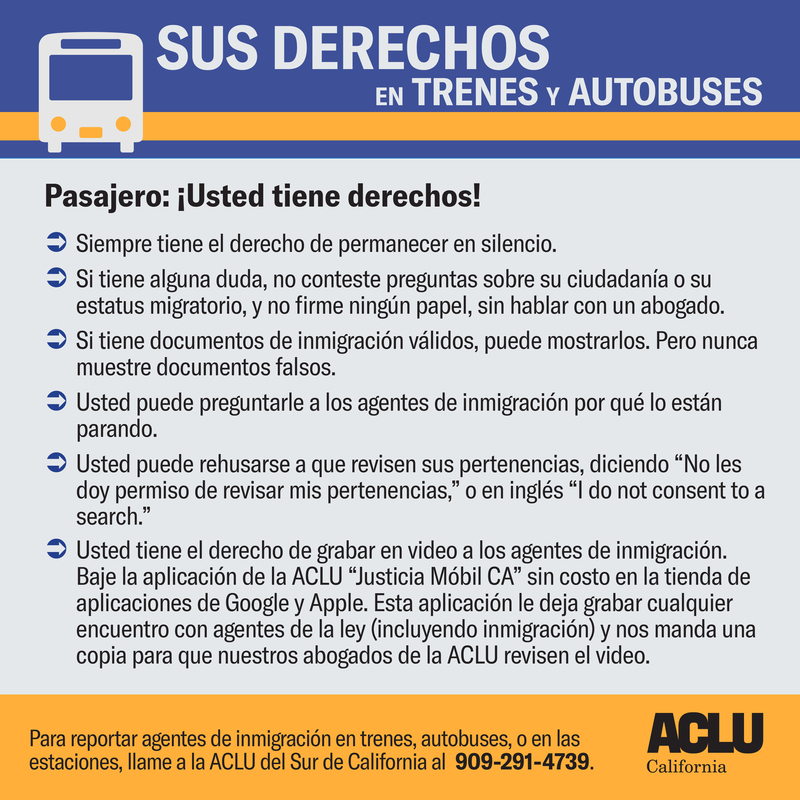 In the past couple of months, the ACLU alongside many Immigrant Rights orgs have documented an increase sightings of CBP on Greyhound buses (See Appendix A for more stories across the U.S.) As a result of this increased activity, the ACLU is providing community members and leaders like yourself with the tools to help you fight back! 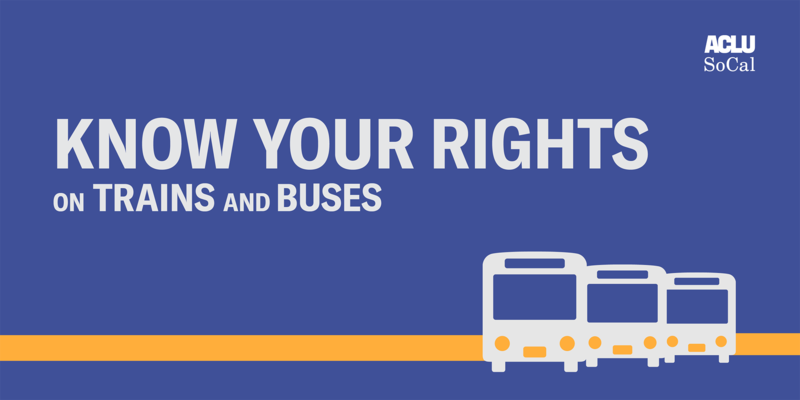 This section will focus on how you can host your own action targeted at Greyhound to ensure all of their riders know their rights if they encounter CBP agents on board and the public education you can do with bus drivers about the legalities of CBP accessing these buses. Step 1. Organize a team of Community Members who are interested in the issue (especially those who have been impacted by issues related to profiling with CBP or those who have been questioned while traveling). Step 2. Read this Toolkit with your group and make sure to review it to cover any questions you may have about the content. Email Lnolasco@aclusocal.org with any questions. Step 3. Watch the training webinar. Step 4. Print out the KYR documents or find them on our site at aclusocal.org/kyr-onboard. Step 5. Look at bus schedules on the Greyhound website or give a call to your local station to confirm times. This is to ensure that your local event is timed to coincide with a bus either arriving or departing to ensure the maximum number of travelers get this information. Step 6. Create your event on People Power. People Power is the ACLU's platform for grassroots action. By mobilizing in defense of our civil liberties, volunteers will build and strengthen local communities that affirm our American values of respect, equality, and solidarity. Step 7. Come up with a security plan for the event in case police or CBP question individuals. Create a way for allies (U.S. citizens) to distract law enforcement and ensure that any vulnerable individuals (undocumented folks and folks either on parole or probation) are out of the way and in a safe location out of harms way. Step 10. The day of the event make sure that your group has either recognizable t-shirts from your local group or color coordination alongside all the printed materials. Make sure you also bring with you a portable table to set up on a public sidewalk for distribution of materials. Set up on a public sidewalk or in a government-owned portion of the bus station, if applicable (rather than on Greyhound/private property), making sure to leave enough space for passers-by and passengers to pass. Step 11. Engage with community at the Greyhound station about their rights & approach those individuals who are either waiting to board a bus or those who are stepping off from a bus. Feel free to adapt this sample script when engaging with individuals. "Hello! My name is X and I am a volunteer with the ACLU of SoCal. We are out here today providing all Greyhound/Amtrak travelers with information about their rights regarding Border Patrol. 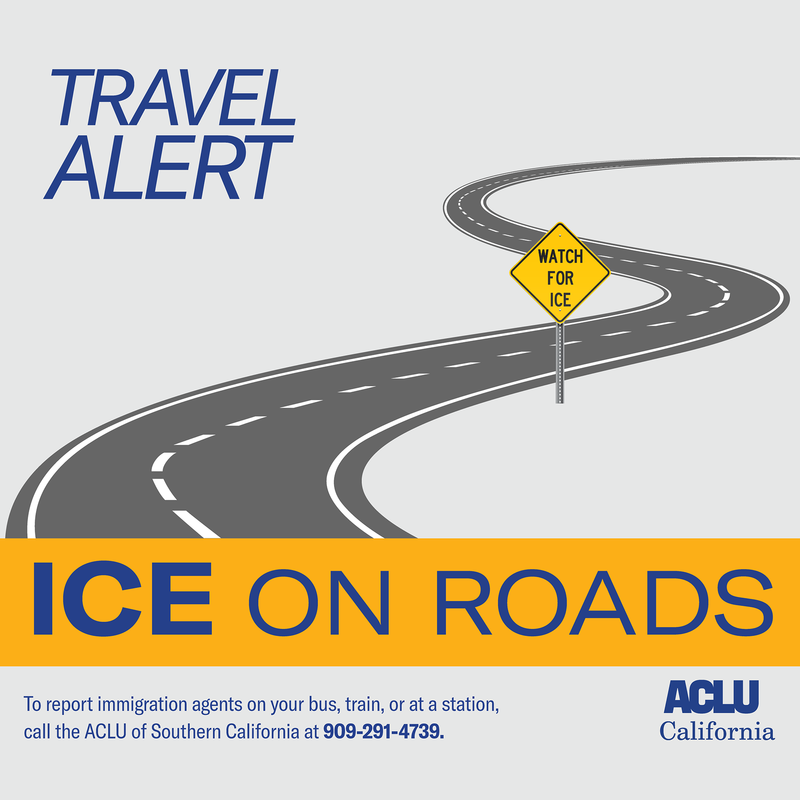 We understand that there has been an increased number of sightings and we want to make sure that everyone knows their rights when and if they encounter immigration agents on their bus." "Hola! Mi nombre es X y soy un voluntario con la ACLU. Estamos aquí hoy para proveer información a todos los pasajeros de Greyhound/Amtrak sobre sus derechos si es que se encuentran con la Patrulla Fronteriza en su camión. Entendemos que ha habido un incremento en el número de testimonios sobre la Patrulla Fronteriza en camiones y queremos asegurar que todos los pasajeros conocen sus derechos si es que un agente de inmigración aborda su camión"
See the full letter. This letter may be helpful in sharing with your local bus driver or Greyhound employees if they have questions about the legal authority that CBP may have if they want to board a bus. Contrary to Greyhound's belief, there is no legal requirement that it allow CBP on its buses. Greyhound has a Fourth Amendment right to deny CBP agents access to their buses if CBP does not have a warrant. The only exception to this rule is at the actual border or at at a permanent border checkpoint. Greyhound routinely permits Customs and Border Protection (CBP) agents to board its buses to question passengers about their citizenship and immigration status, and resulting in CBP agents removing passengers from buses and arresting them. CBP often singles out individuals because of the color of their skin or because they have a “foreign” accent. Often CPB does not give any reason, or a reason supported by probable cause, for questioning a passenger. CBP's intrusive encounters on Greyhound often involve a blatant disregard for passengers' constitutional rights. 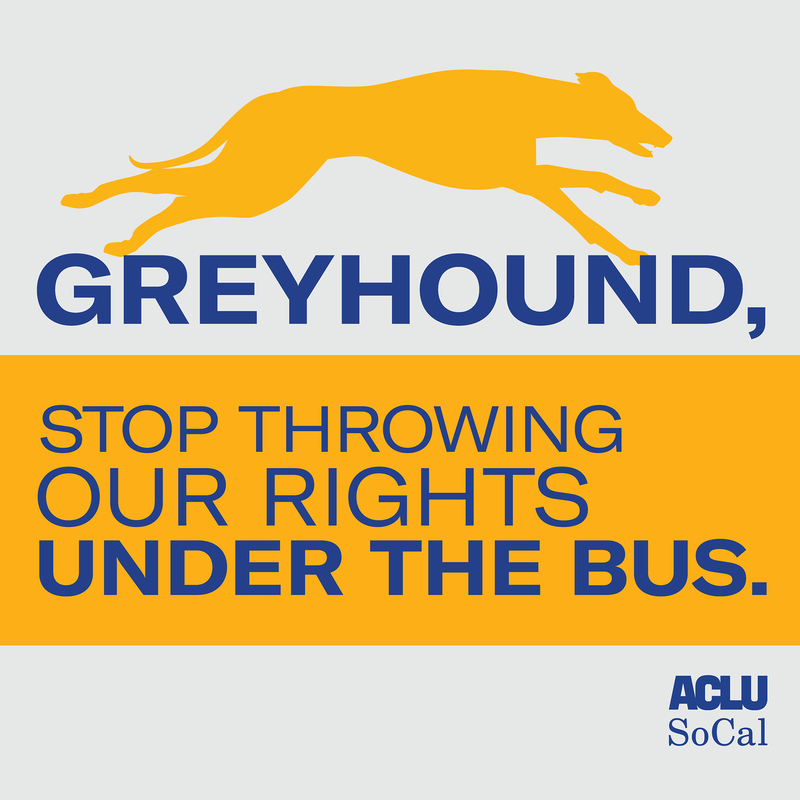 Greyhound's cooperation with CBP is unnecessarily facilitating the violation of its passengers' rights. Greyhound has a Fourth Amendment right to deny CBP permission to board and search its buses without a judicial warrant. Greyhound is in the business of transporting its passengers safely from place to place. It should not be in the business of subjecting its passengers to intimidating interrogations, suspicionless searches, warrantless arrests, and the threat of deportation. 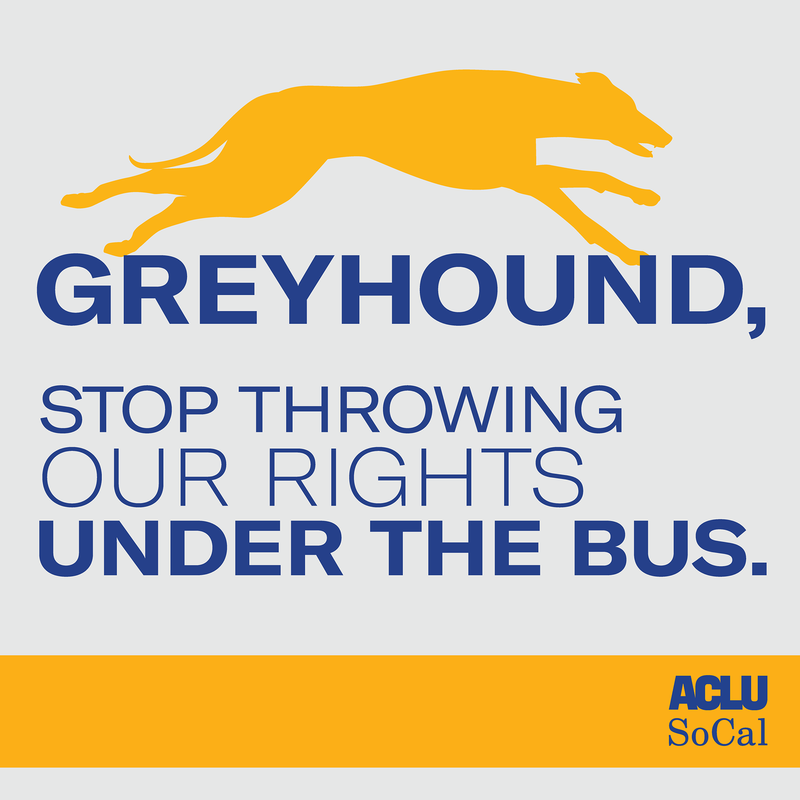 We urge Greyhound to change its policy and to refuse CBP permission to conduct invasive bus raids without a warrant. Right-click and select "Save Image As" to download the following social share images. Rectangle images look best on Twitter and Facebook, square images work best for Instagram. Below is a small compilation of stories, videos and reports of incidents throughout the United States that provide context for section II of this toolkit.